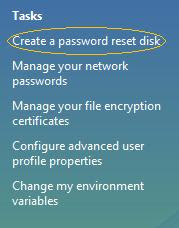 One of the most useful tools in Windows Vista is the Password Reset Disk. If you forget the Vista's password it is possible to reset your account password with this new tool without any problem and any other logon. But you have to prepare a Password key in advance. You can also use your USB drive to store your password key with other data. Follow these steps and create a 'Password Reset Disk' now. How to create a 'Password Reset Disk'? Go to User Accounts in your Control Panel. 1). Connect a Floppy disk or any USB storage device. 2). Click "Create a password reset disk" which is on the left pane. Then "Forgotten Password Wizard" starts. This wizard helps you create a "password reset disk". I you forget the password for this user account and are unable to log on.You can use this disk to create a new password. Select your password key disk from the menu. 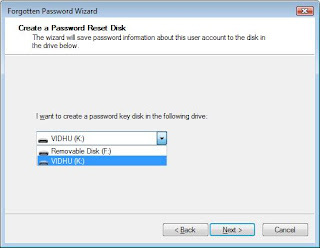 The wizard will create password key on the selected drive/disk. Click Next. 5). Wizard will ask your current password. 6). Password Reset Disk created. You've successfully created a password rest disk for this user account. You can see a file named "userkey.psw" in your Password Reset Disk. On the log in screen you cannot see any reset password link at first. Once you type in the wrong password and press enter The "Reset Password" link will appear. a). Click on "Reset Password" link. Then "Password Reset Wizard" window will open. 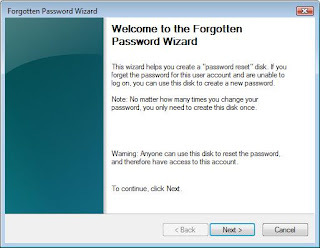 The Password Reset Wizard says that if you forget the password for this account and are unable to logon, this wizard helps you reset the password. 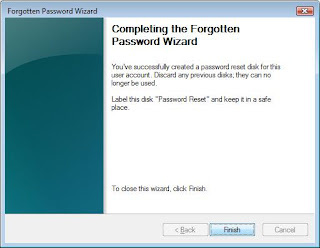 Note: To use this wizard, you must have first create a password reset disk. Select the correct device in which you created the Password Key. The wizard will now ask you to Type a new password and type again the same new password for confirmation, then it will ask you to enter a password hint. You're successfully reset the password for this user account. You will now able to logon with this new password . Note: you can use the same password key disk to reset password in future. You do not need to update this disk. Remember to keep it in a safe place. Now you can logon with new password.